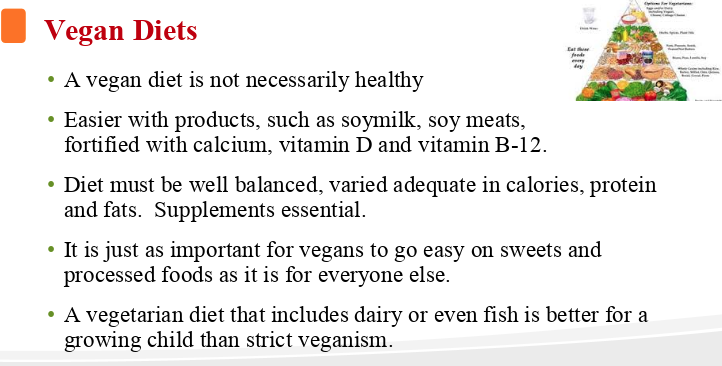 There have been more individuals pursuing vegetarian and vegan diets. 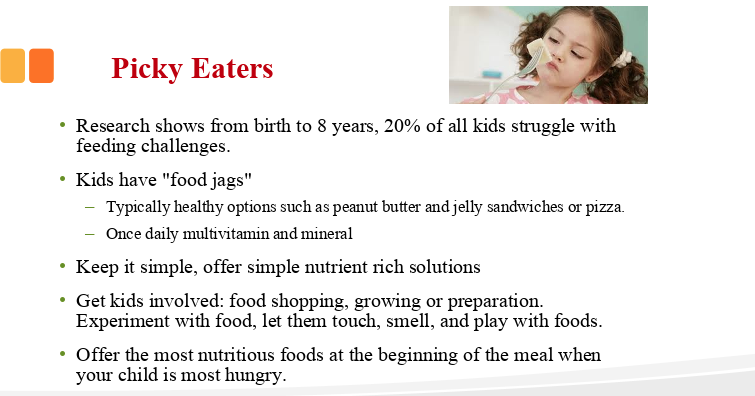 Though increasing vegetables/fruits is a good trend, vegan diets are particularly challenging (& potentially dangerous) in children. 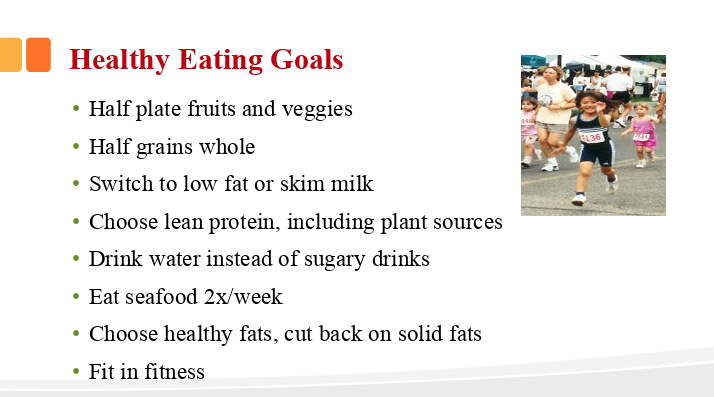 In those who take milk and eggs, this diet is much more likely to meet nutrient needs. 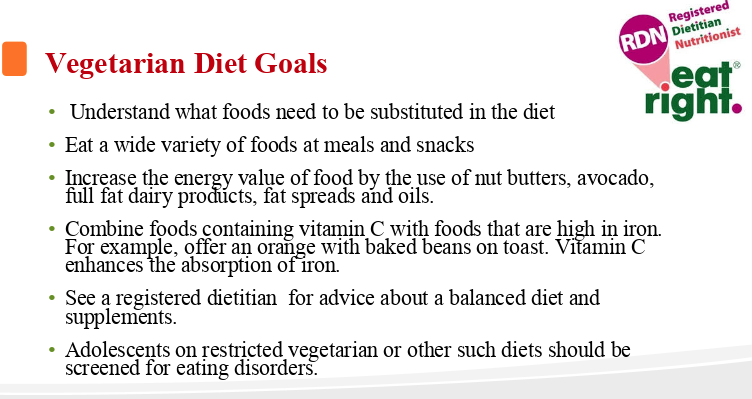 These diets necessitate the assistance of a dietician. 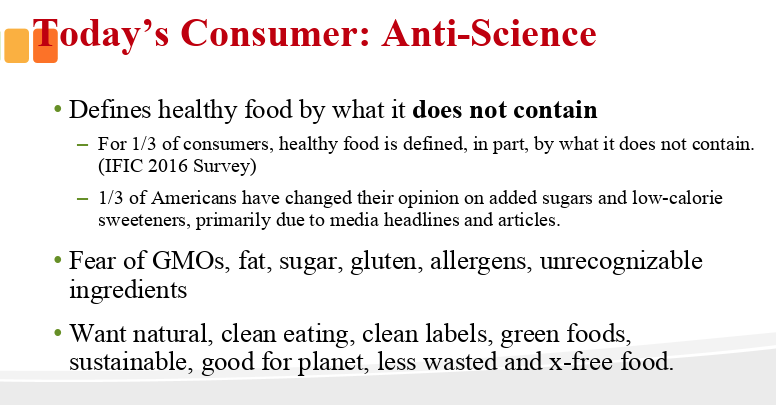 Unfavorable trends: increased consumption of highly processed foods and restrictive food fads. 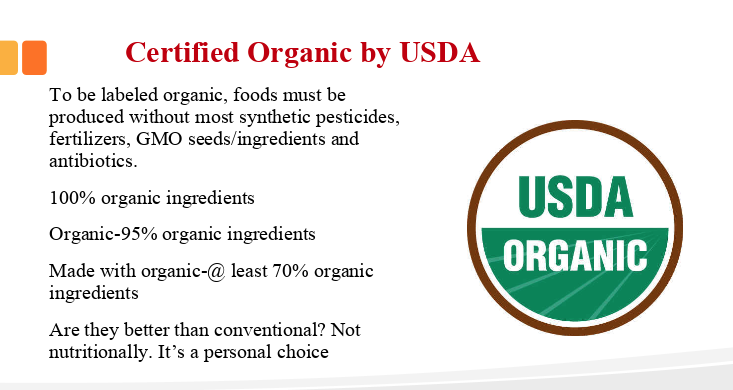 Some processed foods (eg. 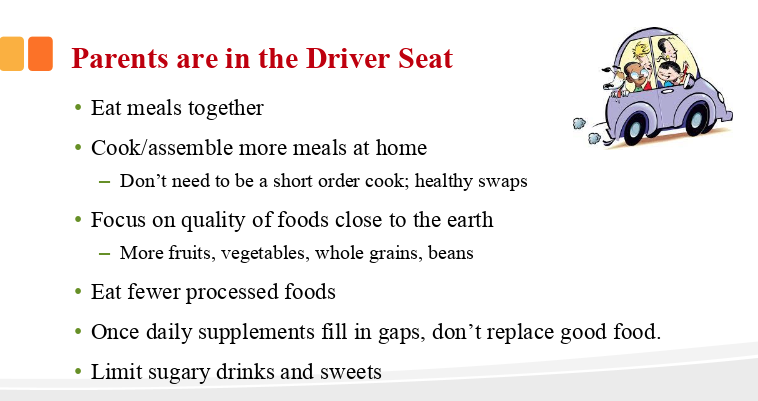 canned beans) can be a healthy addition to diet. 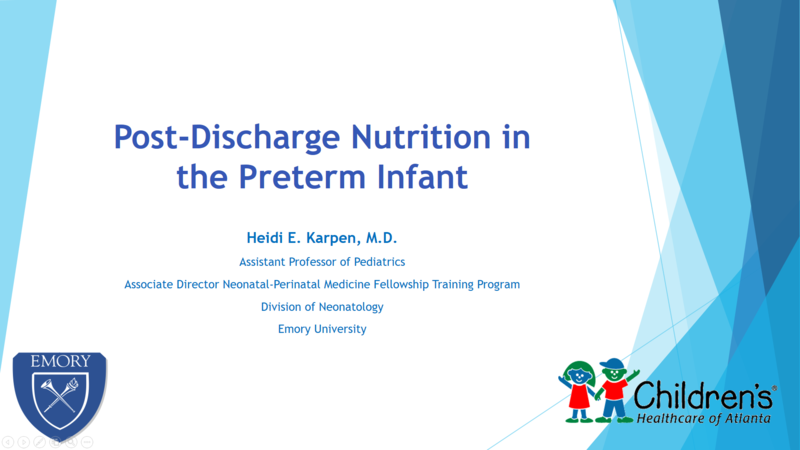 A subsequent lecture on “Nutrition for the Premature Infant” by Heidi Karpen (Emory University, Professor of Pediatrics) provided a good overview of the ongoing efforts to improve nutritional outcomes for premature infants. Good nutrition is crucial for better neurodevelopmental outcomes and stronger bones. Despite efforts like instituting TPN on first day of life, most neonates are losing ground during their hospitalization. Breastmilk is best at reducing sepsis, necrotizing enterocoliitis, and improving IQ. 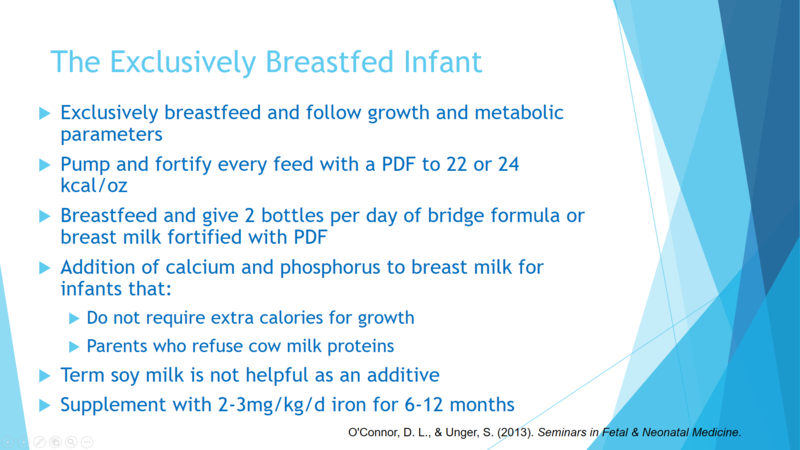 However, it is not perfect –less protein, less calcium, and less phosphorus than formulas; thus, breastmilk needs to be augmented and/or supplemented. Informal breastmilk donation can be dangerous. 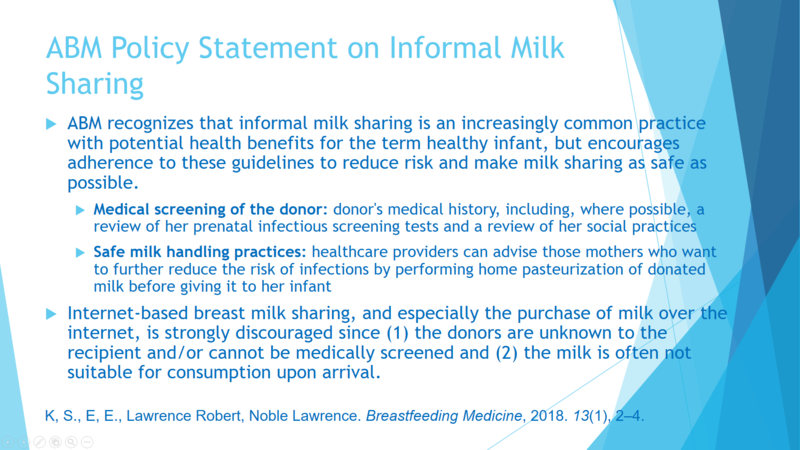 Donor breastmilk needs to be carefully screened. 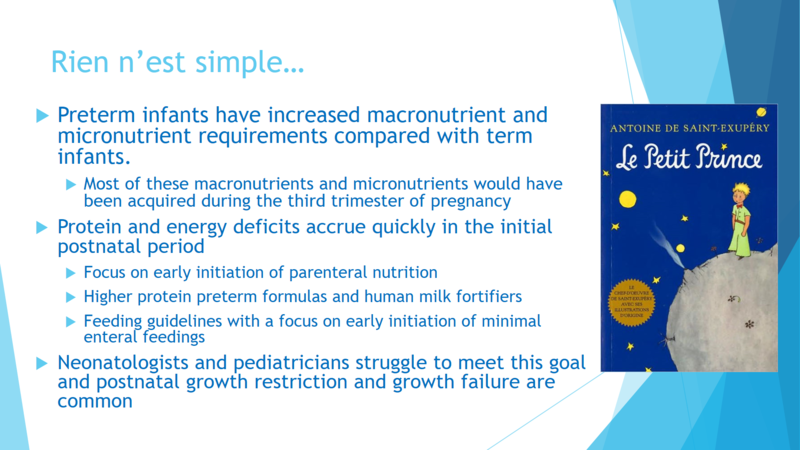 A recent terrific lecture at Northside Hospital’s neonatology conference by Reese Clark highlighted what we know about neonatal nutrition and what we should be striving to achieve. 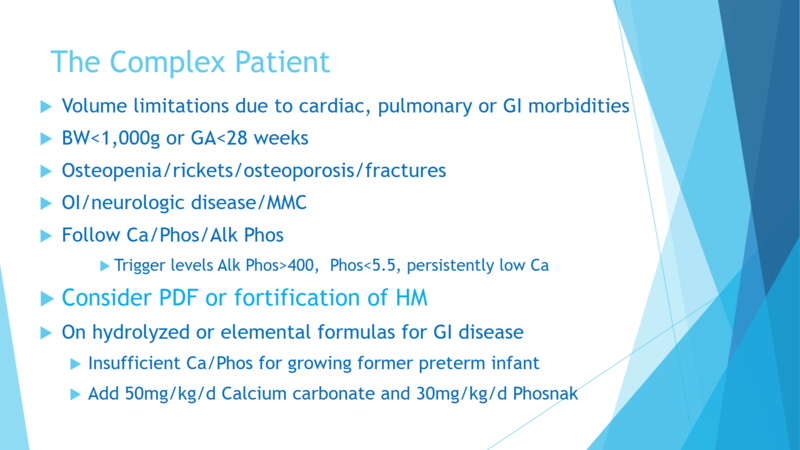 This blog entry has abbreviated/summarized this presentation. Though not intentional, some important material is likely to have been omitted; in addition, transcription errors are possible as well. Every baby needs good nutrition. While this is an obvious point, a lot of effort is focused on aspects of care needed in only a small number of neonates. 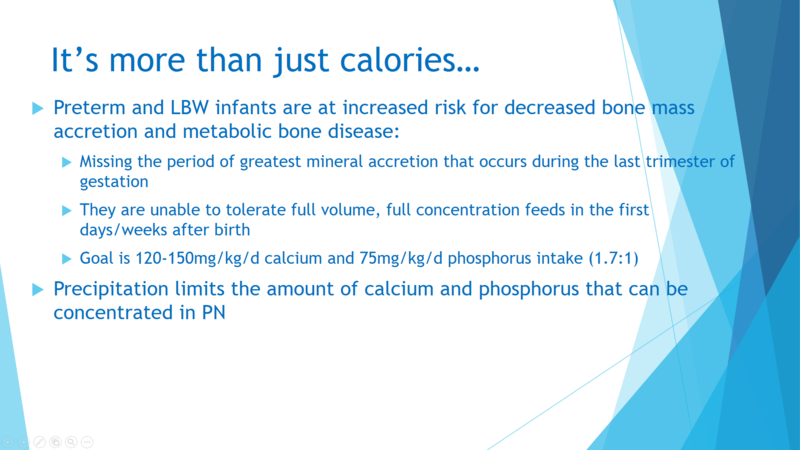 New target for weight gain in premature infants should be 20 gm/kg/day. 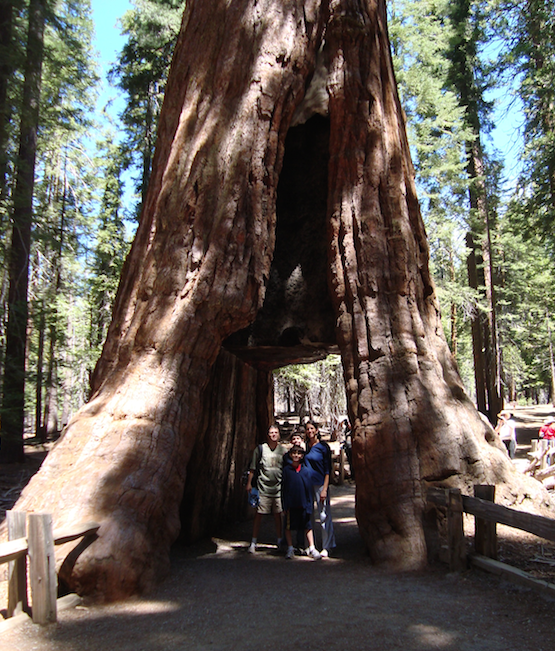 This growth is associated with better outcomes (Pediatrics 2006; 117: 1253 Ehrenkranz RA). In this study, which controlled for a large number of variables, those in the top quartile of growth had much lower rates of cerebral palsy and neurologic impairments. These improvements were also significant when comparing those in the top quartile to those in the 2nd and 3rd quartiles who were not sicker than those in the top quartile. Insulin for hyperglycemia has been associated with poorer outcomes. Does carnitine help with lipid metabolism? No one really knows –no randomized trials. Continuous NG feeds are not associated with fewer signs/symptoms (e.g.. apnea, bradycardia, arching) than NG bolus feeds. 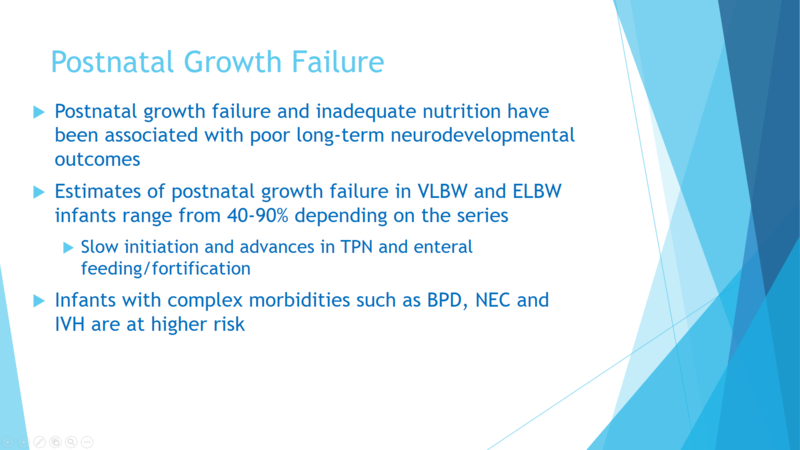 Since there are not going to be any trials randomizing neonates into groups assigned to poor growth, we will not know with certainty the impact of good nutrition on long-term outcomes. 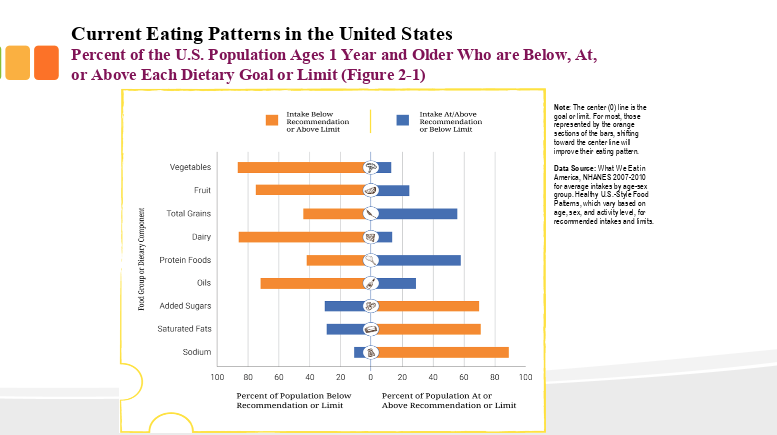 Issues with reverse causation and selection bias make it difficult to know whether those with poor growth had other factors besides their nutritional plan which contributed to their outcomes. 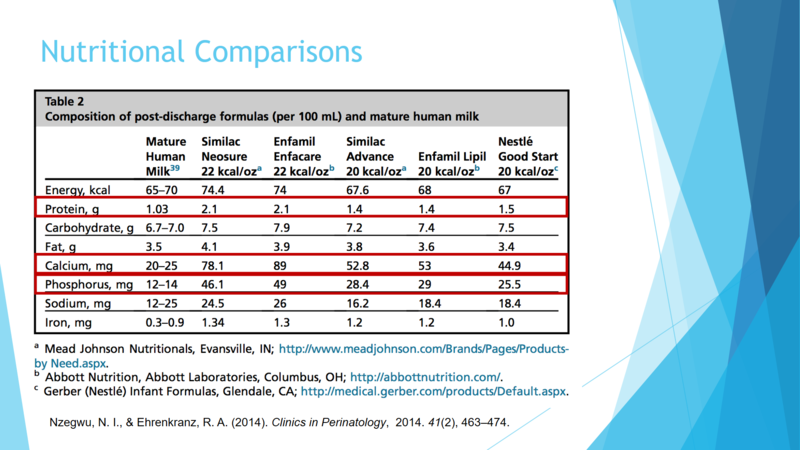 Bottomline: We need to continue to optimize nutrition in premature infants; this includes using human milk and preventing necrotizing enterocolitis (which includes avoid acid blockers). Our goal should be to have infants leave the NICU better nourished than when they arrived.